Before retiring, Ruth taught adults in colleges, universities, and prisons. Ruth has had Therapy dogs for nearly twenty years and with ‘Charlie’ now visits a hospital, a women’s prison and a secure mental establishment. In what little spare time Ruth has since becoming a Trustee in 2017, Ruth enjoys reading, playing the piano and is an active member of the Royal British Legion. 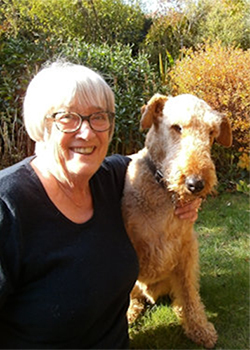 In 2015, Ruth received the British Empire Medal for her dog therapy work in secure establishments.